Spring arrived a couple days early at Style Maker Fabrics and we are so excited to kick off a new season! This time of year is all about new beginnings and a fresh start! After the long, dark days of winter we are all ready for brighter colors, warm sun and long days outside. Time to shed those the warm, snuggly layers for light flowy tops, colorful pants and feminine florals. Prep for our spring collection started just after the first of the year, but it wasn’t until a couple of weeks ago that it really started coming together. After sourcing fabrics from all over it is so exciting to see the pieces matching, coordinating and pairing well together. Today we are excited to finally share the collection with all of you and give the site a fresh look for the new season! In the process of sourcing fabrics for the spring collection, a gorgeous palette of corals, aquas and purples immediately started to develop. Not quite pastel, but not overpoweringly bright either, we like to call describe these colors as our favorite sorbet or ice cream hues. You have probably heard that Pantone’s color of the year is Ultra Violet and this season, the purple influence is everywhere! From springy hues of orchid and lavender to richer shades of plum and eggplant, we are loving the range of this crowd favorite color. Watch for knits, shirtings and bottom weights in a variety of shades in the shop this season. In terms of prints this spring, we are excited to that florals continue to be wardrobe staples. Typically found on drapey rayon challis or crepe, we are excited to offer a selection of other floral printed substrates including linen shirtings, stretch sateens and stable knits. It is always good too have more variety and versatility! Speaking of variety! This season is the the season for pants! 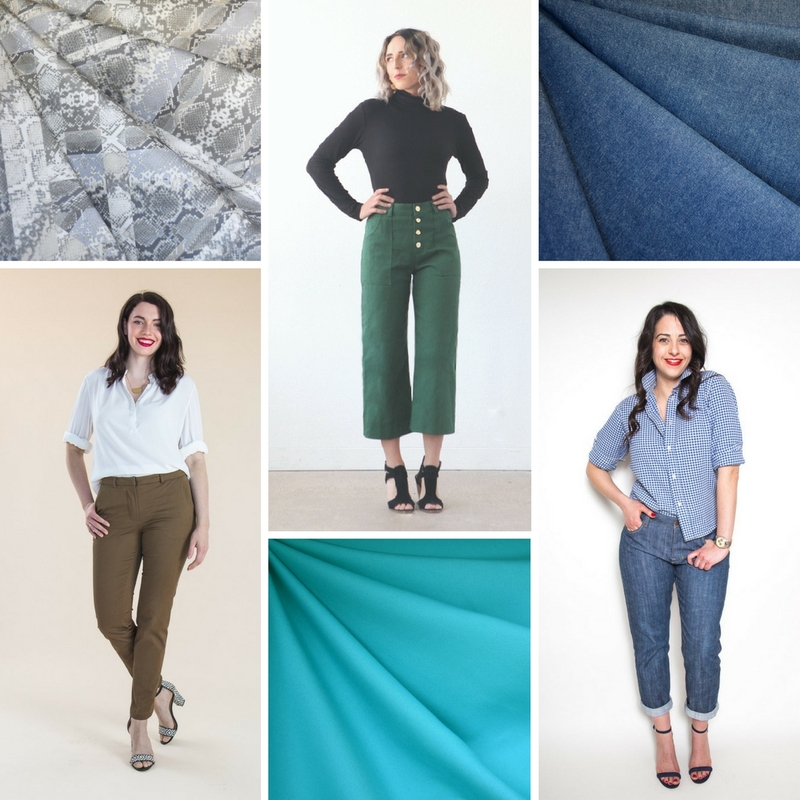 We are so excited to offer our largest selection of bottom weights to date—stretch sateen, cotton twill and denim (both stretch and non-stretch) all in a variety of finishes, colors and a few prints for good measure. Pair these with some of the great indie pants patterns available now and your are set! Our swatch videos with Inside the Hem have become a must each season and they are a great way to get a “closer” virtual look at some of the new fabrics. Grab a pen and paper and a cup of tea and enjoy over an hour of spring fabric talk, inspiration and garment ideas. Not a bad way to spend a Sunday afternoon! Our favorite part of launching a new collection is seeing how everyone will transform the fabrics into new wardrobe favorites. 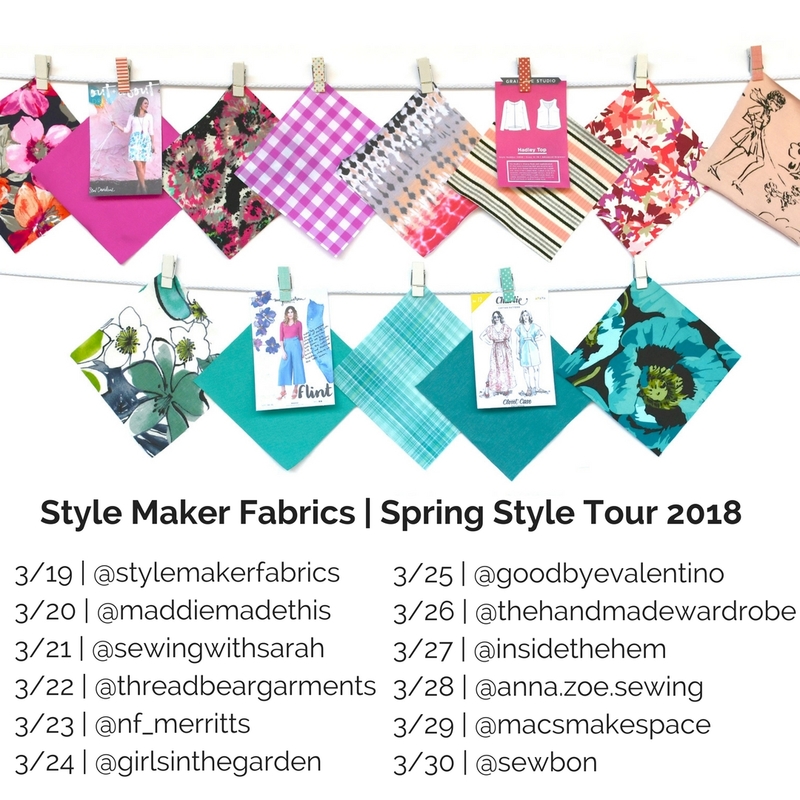 To jump start your spring wardrobe inspiration, our spring style blog tour launches tomorrow right here on the Style Maker Fabrics blog! Follow along each day to see what each of the amazing seamstresses sewed up. The full line up and links to each blog are shared below. In honor of the arrival of spring we are offering $5 shipping on all US orders. Any order, any size ships for just $5. International orders will also receive a special discount. This special will run the full two weeks of the style tour and will end Monday, April 2nd at 11:59pm PT. As with all of our designer fabrics, many of the spring fabrics have a very limited quantity. We never know how long they will last or if we are able to get. If there is something you love, you might want to get an order in earlier rather than later. Oh my- I love all these fabrics and can’t wait to see the inspiration in store for us!